This listing is for 1000 New BCW Brand Current Comic Book Bags. 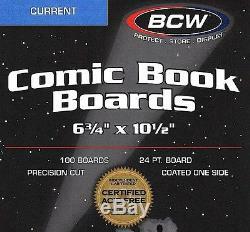 1000 New BCW Brand Current Comic Book Backing Boards. 10 Retail labeled Packages of 100 Current Bags per Package. 10 Retail Labeled Packages of 100 Current Backing Boards per Package. 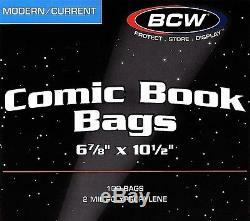 BCW Brand Current Comic Book Bags. 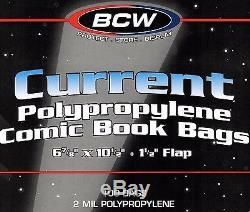 The BCW Current Comic Book Bags are an acid free, archival quality product made of crystal clear polypropylene. Use this item to protect and store your collectible Current Comic Books. Use with BCW Current or Modern Comic Book Backing Boards. 6 7/8 x 10 1/2 inch with. 1 1/2 inch flap for closure. 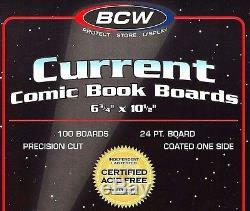 BCW Brand Current Comic Book Backing Boards. The BCW Current Comic Book Backer Boards are made from a full 24 point solid bleached sulfate, buffered with 3% calcium carbonate and are precision cut to size. Use this item along with Current Comic Book Bags to protect and store your collectible Current Comic Books. Fit in BCW Current Comic Book Bags. Buffered with 3% calcium carbonate. 6 7/8 X 10 1/2 inches. Thank you for looking at my item! The item "1000 Current Comic Bags and Boards New BCW Storage Supplies" is in sale since Tuesday, December 13, 2016. This item is in the category "Collectibles\Comics\Storage Supplies". The seller is "pinkhaloangel" and is located in Chilton, Wisconsin.